This species of dabbling duck is called pintail since males sport beautiful long tapering tail feathers. The male's head is dark in color with a white patch on their breasts that tapers upwards along either side of their neck. Their primary and tail feathers are dark brown and slate in color. The females are tan in color. Their dull coloring helps them camouflage from their predators. Pintails migrate in search of appropriate feeding and breeding areas. They usually nest close to water under vegetation cover to protect their nests and eggs from predators. 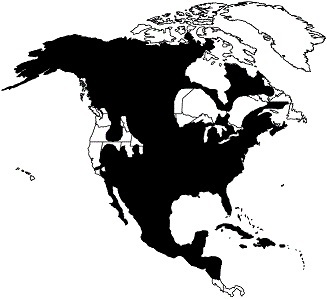 Pintails are monogamous, breeding in late spring. During breeding season, the males demonstrate a courtship display to attract females. The females lay approximately 7 to 9 eggs that are incubated for 22 to 24 days. Ducklings fledge when they are two months old. 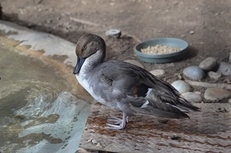 The zoo houses a pair of pintails in a mixed species aviary.